This is from Old School Frozen Custard in Capitol Hill. I think that you can get regular scoops of custard in cones which are pretty cheap. But I got this instead, and it was kind of $$ and I couldn't finish it, but it was really delicious. 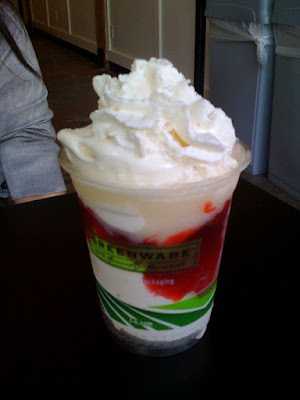 It was frozen vanilla custard with strawberries and whipped cream. I don't know how to explain what it tastes like because it's not totally custardy or ice creamy either. I was really sweet and rich, and the strawberries helped tone that down, I think. Elyssa got some that came in coffee, which I don't have a picture of. But it was really weird because the coffee was still warm but the custard was cold, and when I ate it, I couldn't really decide what temperature to feel. But it was good too. This one is from Neal. 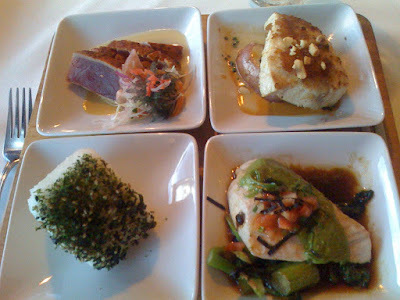 "this is called the surfboard sampler, haha, with three different fish, first is the blackened ahi (tuna) with a spicy soy mustard butter sauce i think it had wasabi in it, second is the macadamia encrusted swordfish with a lobster cognac sauce, and third is the monchong with jade pesto in a ponzu sauce." I think the bottom left dish is rice covered in nori and sesame seeds, but I'm not sure because Neal never told me. Last week I went to a Mariner's game and had garlic fries for the first time in a long time, and god they were so good, so now I am going to make some and I hope that they taste just as good. yes it's a rice ball covered in nori! damn frozen custard bye the way do you ever eat the polish sausage at costco?